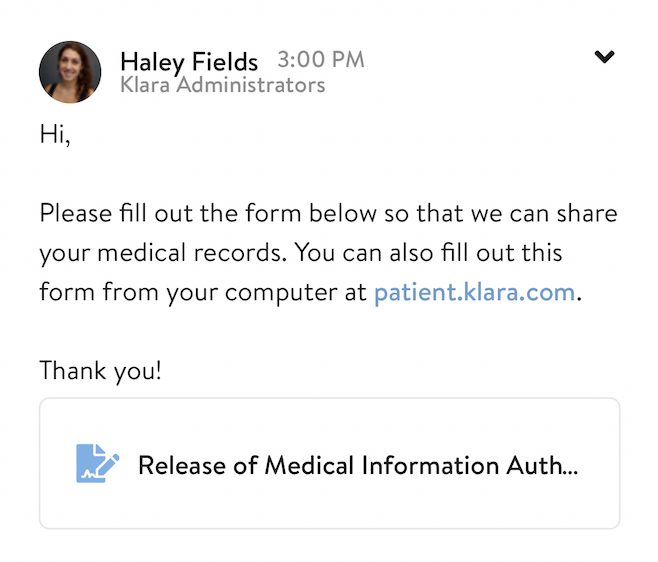 Klara has made it easy for you to fill out and sign forms from your doctor's office without having to print, scan, or fax - or arrive at your appointment early. 2. To complete the form, you can simply click on the attachment (the box with the icon), and you will be brought to the form. 3. Then, click into any text field, and type out your information (as shown above). Note: for some longer forms, it might be easier to fill out from your computer, rather than your cell phone. Remember, you can always access your account from patient.klara.com to complete your form from a desktop. 4. Once you've filled out all of the required fields, you can submit the form by clicking "Continue." As soon as it's completed, the practice will receive a confirmation that you've completed the form, and can reach out via Klara with any additional questions.